Don't know or have time to use Photoshop or Illustrator? 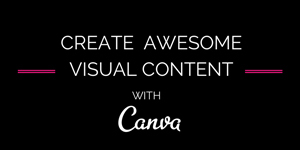 Well, now there's Canva and it's disrupting the graphic design space with their easy-to-use platform. It's free and allows users to create graphics for everything from flyers, Facebook posts, business cards, posters and invitations that can be used digitally or for print. Start by selecting one of their layouts or create a custom one. Choose from their library of graphics (lines, arrows, frames), backgrounds or fonts or upload your own. They also have premium ones that cost just a dollar. Once you have your layout and images in place, you have the option to alter photos with their simple editing feature. Getting started is easy too. They have a variety of tutorials to help you learn best practices and how to navigate the program.